In our troubled times is good to have a respite from the real dangers we and our families face every day. 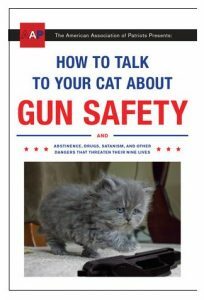 Which is why this week’s read is most welcome: How to Talk to Your Cat About Gun Safety: And Abstinence, Drugs, Satanism, and Other Dangers That Threaten Their Nine Lives by Zachary Auburn. One would hope that this is brilliant satire, but while reading it some times seems serious – which means it is quite brilliant. How to Talk to Your Cat About Gun Safety by Zachary Auburn is available from Amazon and other fine booksellers. Lost Cowboy is powered by	WordPress 5.0.4 and delivered to you in 0.940 seconds using 45 queries.